What is the best time of the year to shop? The day that we can sit in our fat pants like an overstuffed turkey and shop ’till we drop from the comfort of our couch. If you missed my ‘Best of’ list for Black Friday shopping, you can read that, here. Most of my favorite stores are having some killer deals today. I saw some big deals going on over at Carter’s, Kohls, Target, and more! But, in my opinion, no one beats Cyber Monday deal over at Amazon! They are having a whole week of deals for Cyber Monday so Black Friday was just a warm-up. How do I Participate in Cyber Monday on Amazon? Well, you don’t need to be a Prime Member to participate in Amazon’s Cyber Monday, but, really you NEED to become a Prime Member. Prime Members Only get access to daily deals and lightning deals first and you get free shipping and a ton of other perks. Consider becoming a Prime Member. There is nothing like seeing something you love, scanning it on your Amazon app, tossing it in your cart, using the one-touch purchase option, and it suddenly showing up at your house 1-2 days later. To learn more about all the cool stuff you get when you become a Prime Member click here ! I will be updating this page LIVE as the deals roll in on Cyber Monday. So check back here to find deals on all things baby, family, kids, and more! You will see the deals at the bottom of this page. If you are expecting, make sure you start an Amazon Baby Registry . It will help you organize the items that you know you want to purchase. After you have added the items to your registry, you can check it on Cyber Monday to see if the prices have gone down on any of your items and purchase them. Great way to keep track if you will be purchasing for a new baby anyway in the coming months. Start your Amazon Baby Registry here. Lightning Deals are deals that are on sale for a specific period of time and typically have a limited number available so they sell out fast. Daily deals will last the entire day. You can see a preview of some items that will be available for daily deals and watch for Lightning Deals here ! 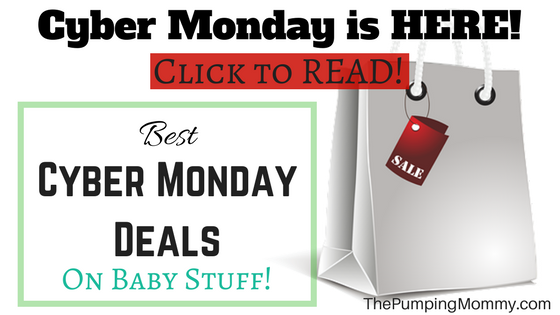 The Pumping Mommy’s Best LIVE Amazon Cyber Monday Deals Here! Bookmark this page and check below for the best Cyber Monday deals as they come LIVE. I will be updating this page with deals all day (well, all week really). There are some great preview items to watch so be sure to check those out here. See ALL Cyber Monday Deals HERE ! See ALL Deal of the Day Sales on Baby Items HERE ! See ALL Baby Gear Deals HERE ! See ALL Car Seats and Accessories Deals HERE! See ALL Diapering Deals HERE ! See ALL Feeding Deals HERE ! See ALL Healthy and Safety Deals HERE ! See ALL Nursery Items and Furniture Deals HERE ! See ALL Stroller and Accessories Deals HERE ! See ALL Toys and Gift Deals HERE ! See ALL Cyber Monday Deals – HERE!